My previous shows have explored seemingly opposite aesthetic realms. I therefore felt it was important to juxtapose these oppositions within a single work. Our springboard is the notion of beauty that stems both from order and from disorder. We shall examine these different types of aesthetic experiences, which are seemingly contrary and yet inseparable, through the prism of Apollonian beauty versus Dionysian beauty. This leads to an inquiry into the Nietzschean view of tragedy — how it is born from the reconciliation of conflicting gods. 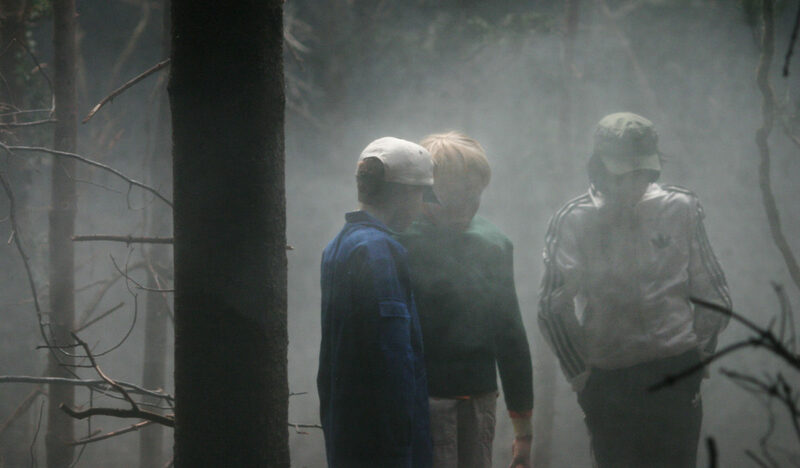 The action takes place in a very naturalistic forest. The landscape, at first realistic and then increasingly symbolic, is inhabited by three characters in search of a spiritual experience. The landscape plays an active role, mirroring the three characters’ inner experience. Beauty linked with order and with the force of benevolent nature is transformed into chaos. This shift is propelled by the landscape, which echoes the development of one of the characters in particular, raising questions about the disturbing dichotomy between civilization and savagery. Our desires and repulsions, triggered by these divergent aesthetic experiences, animate our sensations and thoughts, and elicit moral issues that are eternally relevant. We are often drawn to opposite aesthetic poles, reflecting the ambivalence of our existence. The dichotomy between Dionysian beauty and Apollonian beauty is the pivot for our inquiry into the following issues: our driving force, as humans our primitive instincts, the euphoria arising from our basic nature, our carnal rapport with the world, our quest for meaning, and our ability to channel and shape the forces of nature. When this aesthetic dichotomy spills over its borders, triggering radical modes of behavior within the community, a disturbing element emerges. This occurs, for instance, when the beauty of order is used for political propaganda, or when the beauty of ruin inspires vandalism or justifies violent acts. Thus, a potentially disturbing aspect is always embedded in the aesthetics of order versus disorder, ultimately reflecting our driving force. Through art, we can embark upon a sincere dialogue with our deepest urges, and experience them without toppling the community’s equilibrium. The show’s core elements are treated as archetypes, in the vein of a contemporary myth. The characters thereby symbolize forces of nature and aspects of the human condition. 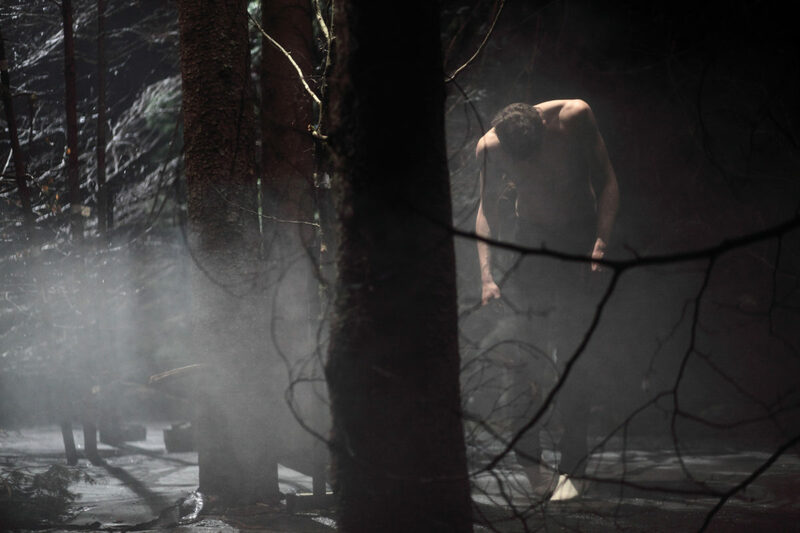 The scenography (we use this term to include sets, objects, lights and machine-generated phenomena) depicts a landscape with immense potential for transformation: a forest, which is initially pleasant and safe, and then becomes frightening and dangerous. This scenographic shift parallels the entire show, which begins in a state of order linked to civilization, and then veers into savagery, thus inciting us to examine the dichotomy. Since the time of medieval literature, the forest has been a narrative archetype for spawning contrary themes such as love, adventure, quest, enchantment, vision, and their shadier counterparts of death, madness, penitence … transforming an idyllic environment into a nightmare. The show’s three characters are also archetypal: a trainer stands for authority and orderliness, a young female athlete for beauty linked to perfection, and a young rock star for beauty linked to ruin. These post-adolescent idols embody oppositional ideals — contradictory canons of beauty arising from contemporary culture. These two idols strongly oscillate between an embodied and a disembodied interpretation. While perceptual space turns from real into mental, these characters, appearing to be figures, instead emerge to be fantasies. Ghosts stemming from the spirit of the trainer. The forest initially appears as a site for health and sport, encouraging a civilized and educated body-rapport. The trainer and young athlete reveal how they relate to body and world by way of a choreographic score that is nearly silent. Dance is linked to health, and the aim is an ideal relationship between body and psyche; the body conveys the beauty and loftiness that occur when man is in harmony with nature. While at first the trainer seems to be the one exercising authority over the athlete, it soon becomes clear that the athlete has an even more tyrannical relationship with herself. Both characters are motivated by self-control and willpower. They both strive for perfection, and yet they do not hide their deep inner conflicts, which we glimpse alongside their goals. We are made aware of the painful relationship they have with their own imperfection. Their diverse torments create a rift, which causes them, following very different paths, to reassess their values. Due to a series of seemingly exterior phenomena, the internal growth of both characters, and the arrival of a third character, the forest is soon revealed as a place of savagery, far from civilization and morality. 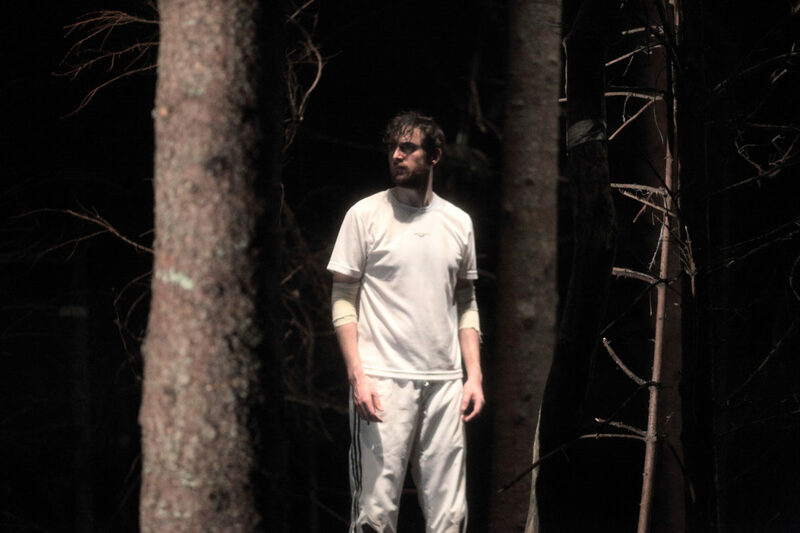 At a turning point in the plot, the forest and climate become highly ambivalent, and unfold independently of the protagonists. Their status will change radically and will overturn the show, through a score full of provoked natural phenomena. The poems are interwoven with Dennis Cooper’s prose, which bursts in and foreshadows the pending aesthetic upheaval. They blur our understanding. Though we understand that separate internal voices all come from the same person, the trainer. The advent of Cooperian beauty, beauty linked to disorder, is at first expressed in a vision and prophetic poetry, and then enacted in a more narrative register. The incoherence that appears reveals a fundamental mental aspect: a hodgepodge of confused thoughts and a rejection from clarified bursts of consciousness. These disturbances at first appear surreal. They are rationally justified and personified via a young male rock star in search of exile, a descendant of Werther and cousin of Kurt Cobain. He embodies beauty linked inseparably to ruin. The encounter between the trainer and this suicidal character unleashes primitive urges and chaos. The forest turns into a den of iniquity, where the characters bare themselves and are tormented by their unbridled passions. After the rock star’s entrance, the show undergoes a development that is partially verbal, and ends up with the trainer brutally murdering the rock star. Through the music, movement and entire aesthetic fabric, both the audience watching the startling murder scene and the young athlete performer, a hidden witness, intuit that pleasure can be derived from ruin and annihilation. It seems as if the athlete is voicing this realization from the depths of an abyss. The problematic of aesthetic pleasure caused by ugliness and disharmony dissolves into the sheer pleasure of listening to dissonance, being ultimately an aesthetic mechanism triggered by our own will. The interplay of tensions between harmony and disharmony can be a source of intense jubilation. Jubilatory violence arises from a blend of strong pain and immense will, and this is what animates the three characters. The forest is, among its various guises, a site for spiritual quest. This quest eventually is the critical aspiration which animates the three characters, whom seem to become one and only one, the trainer and the two ghosts projected from his imagination. While the characters all pursue a spiritual quest, they are unable to articulate what they’re searching for until they experience the dichotomy between order and chaos, reason and urges, control and abandon. At that moment, they grasp the contradictory forces that fuel them and create their inner antagonism. The characters each undergo a physical experience that entails the revelation of a deeper spiritual truth. Their trials are linked to their goals and inner dilemmas, and these conflicts appear onstage as aesthetic contrasts. This aesthetic tension is also developed in the scenography. The forest, the climate, and the ever-changing landscape, are made to mirror the characters’ moods and psychology, in line with the Romantic tradition. As mentioned above, the forest’s ambivalence heightens the shift from naturalist space to unreal space. 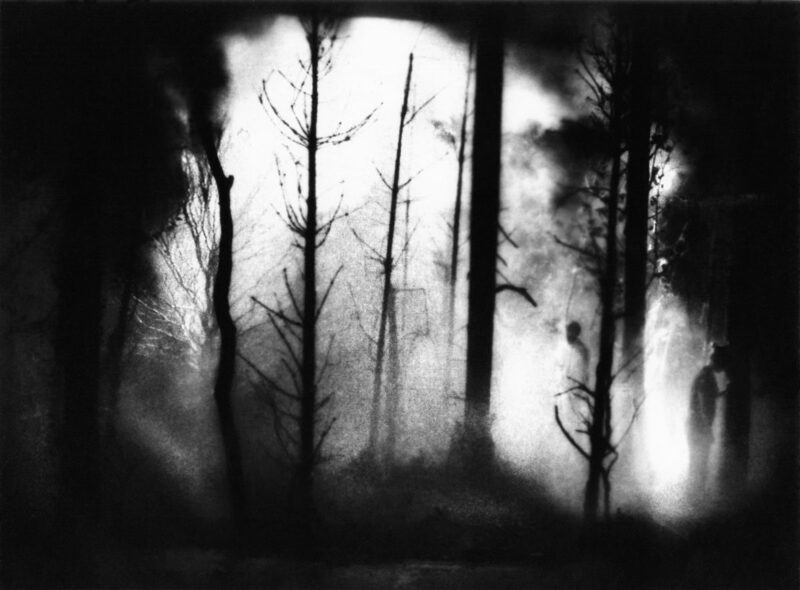 The dramatic potential of the natural phenomena, whereby forest and climate are depicted by scenographic devices, at times is in dialogue with the characters, and at times unfolds independently. The visual art work aims to create and unleash natural phenomena that are experienced physiologically and psychologically by the characters as well as by the audience. We are interested in the gap between a rational expectation caused by an event, and the resulting physical experience. We wish to explore the impact of climatic phenomena on our emotions and sensibility. Our collaboration with Shiro Takatani, lighting artist Patrick Riou, fog artist Fujiko Nakaya, and the entire technical team, will enable us to fully exploit the depiction of nature onstage. We’re interested in portraying the type of landscape that figures in Romantic painting while, at the same time, giving it a formal twist by juxtaposing this landscape with objects and movement. We wish to probe our physical response to this sort of phenomena, which we shall be creating and reenacting onstage. The active role of the music also harkens back to the aesthetic aims of Romanticism. The music reflects the various inner harmonies and conflicts. The compositions of Stephen O’Malley and Peter Rehberg range from displays of Dionysian beauty to spiritual music. This disparity underlies the show’s dramaturgy, whereby speech sometimes becomes impossible and gives way to the intensity of music, which serves as a Dionysian mirror of the world. The music evokes a demon arising from the depths and plays a purging role while paralleling the theatrical presentation in such a way that makes us face that which lurks within. Thus, the music adds a metaphysical thrust that allows us to go beyond speech and image. We wish to probe and fully exploit this force and metaphysical aspect. The dialogue between the show’s various elements resonates and rebounds among the characters, the music, the environment and the text, thus taking us on a journey from chaos to order, from dissonance to harmony, and from upheaval to equilibrium. Finally, the show pays homage to the artistic experience and its vital impact on our spiritual growth. The mystical experience is evoked through the character of the young athlete and the trainer, nearly doppelgänger, in order to highlight the link between mystical and artistic. When we have the young athlete discerning the rock star’s corpse, prompting a profound crisis, our aim is to depict a shattering poetic experience. Both the mystical and artistic experiences can generate deep unease by creating a sense of indistinctiveness between body and world; they respond to the primitive fantasy of unity and arise when we abandon clear-cut perception. These shared characteristics have been explored by George Bataille in L’Érotisme. Finally, the enacted murder and depiction of death take on metaphysical significance, they depict the absence of distinction between body and world par excellence, and thus serve as a metaphor for the artistic experience.